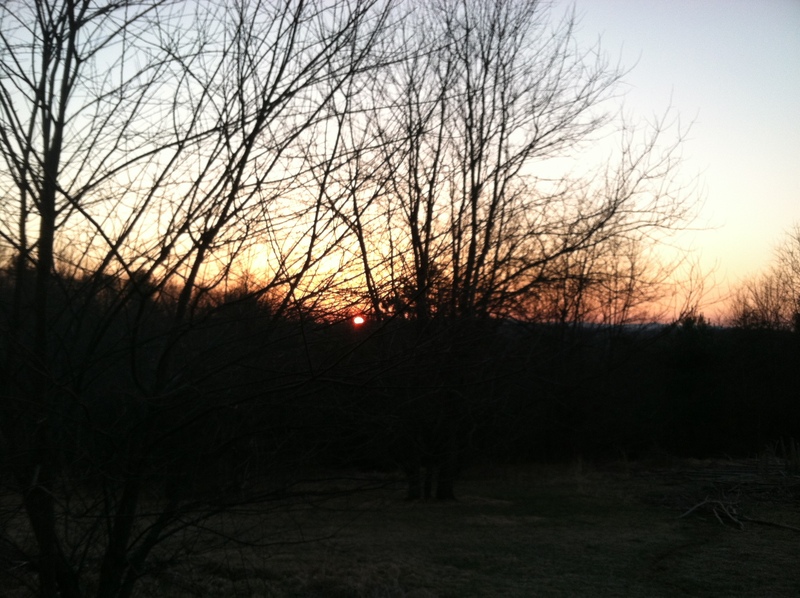 Today is the first full day of Spring, and it’s already off to a beautiful start! The chicks are in the mail! When the lady handed the box to me at the post office, I had to get down on my knees and think “Thank you.” I could hear little mysterious cheeps and tweets escaping from this magic box. I turned up the heat in my car, and drove them back up the mountain as gently as possible up our rugged dirt road. 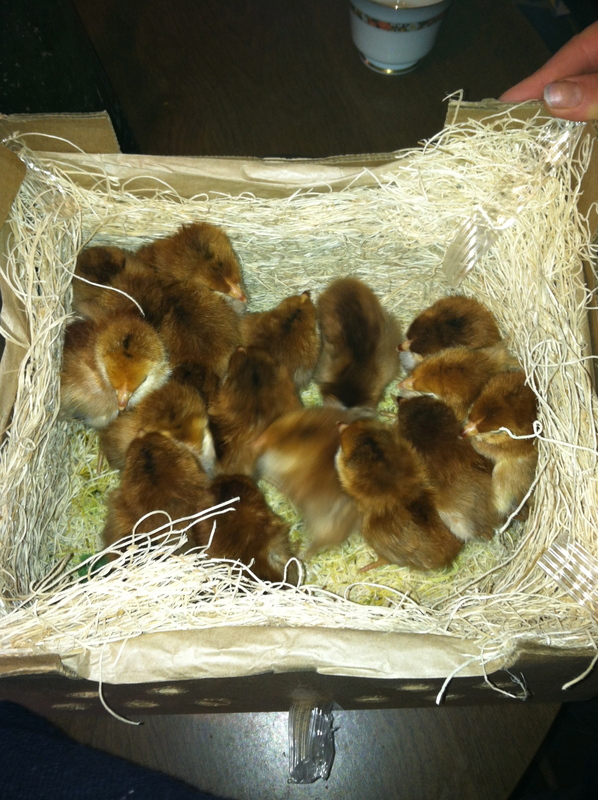 15 chicks traveled for 2 and half days through the US Postal Service. Thank you USPS for calling us and for making sure they made it home safe and sound! As soon as I got home, I woke up Maureen and Timmy. We excitedly hurried to the Octagon house to make a new home for our babies! 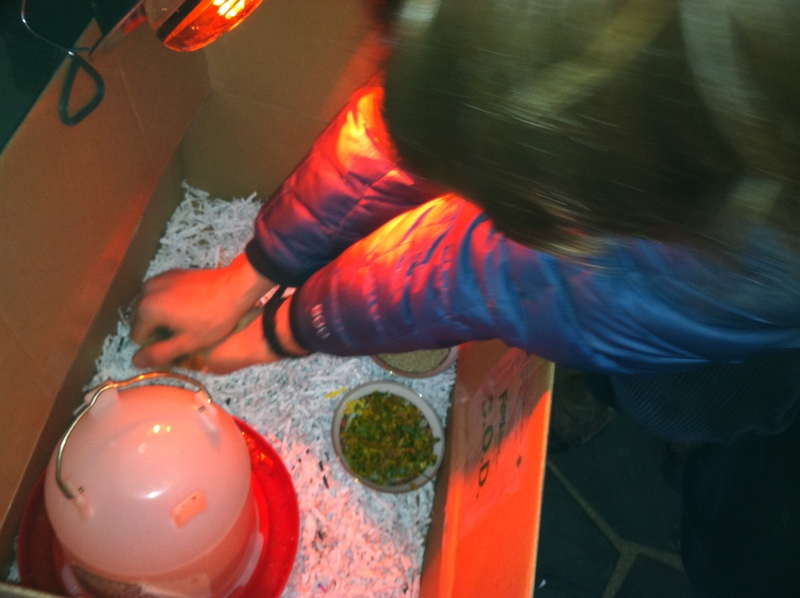 Maureen laid a cardboard box with paper shreds (Courtesy of the Language and Culture Institute) as I hooked up the heat lamp and chopped up fresh veggies. Timmy cooked us a nice breakfast of fresh eggs (ironic, yes) and asparagus. Maureen gives a chick its first drink! 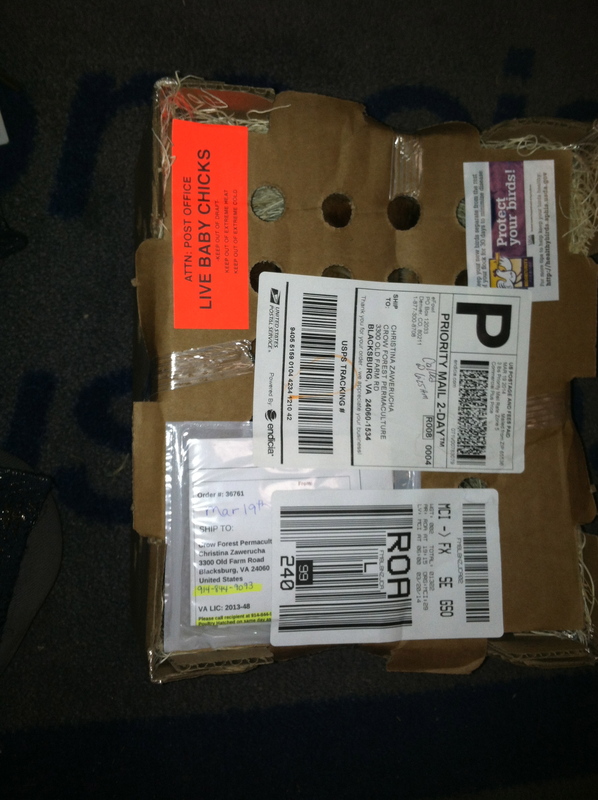 The chicks had been traveling in the US Postal service for the past two days. They have never had anything to eat or drink in their lives. Instead, they are living off nutrients from the yolk of the egg until they arrive in the mail. We therefore needed to give them their first drink. Tim gives a chick its first drink! We gave them water with a little diluted apple cider vinegar and fresh-pressed garlic for health. In order to help them understand the idea of drinking and eating, we acted as mother hens. Each of us took a chick from the mailing box and gently put its beak in the water feeder until we saw it start to guzzle. We added some homemade apple cider vinegar to the water (to add electrolytes) as well as some garlic (for its antibiotic properties). It’s important to give chicks fresh chopped vegetables and wild greens from day 1, just as a mother hen would! 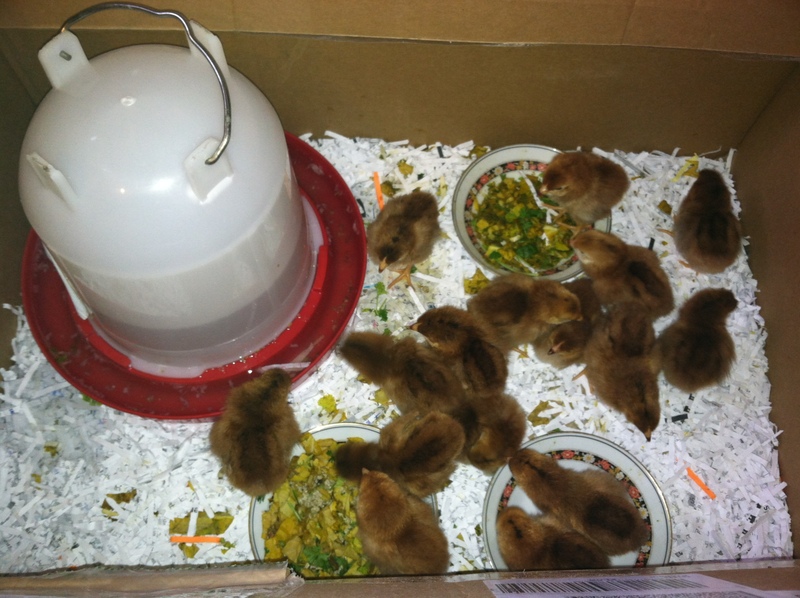 We gave them “free choice” of unmedicated chick starter feed from Blacksburg Feed and Seed as well as fresh vegetable scraps. 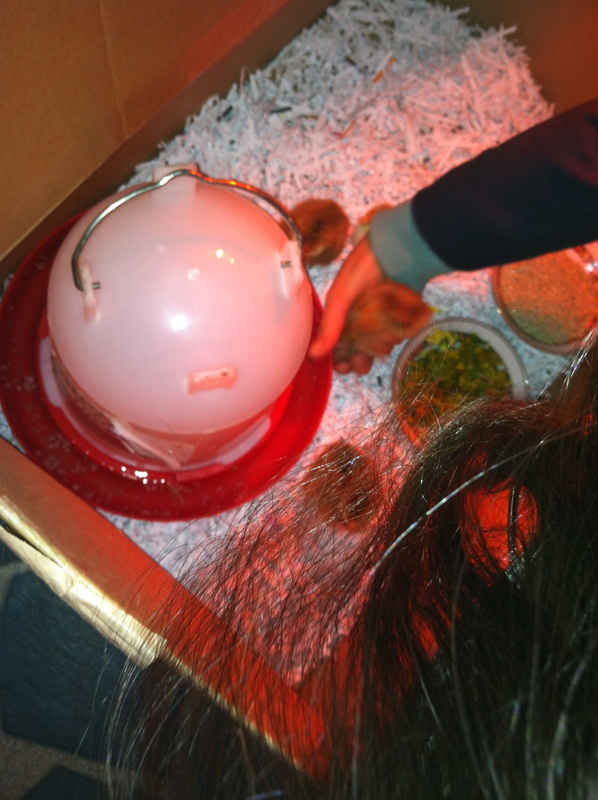 As recommended by Harvey Ussery (The Martha Stewart of Chickens), its important to offer chicks fresh vegetables, grass, and dirt from day 1, just as a mother hen would. In the long-run, chickens that forage and eat a diverse diet of living foods are healthier than those that are fed chicken feed exclusively. 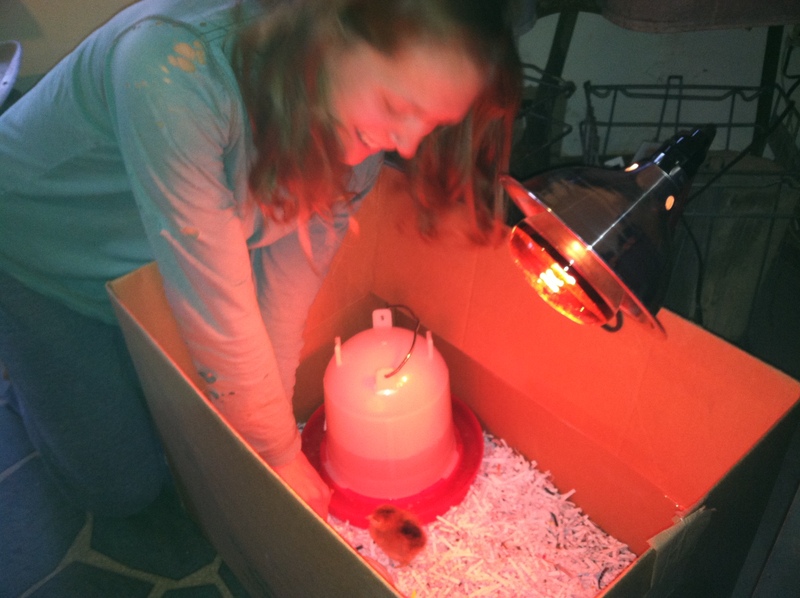 Our chicks in their happy home by the wood stove! Maureen and I then sat around our little chicks, watching them until we needed to head off to work. Each chick has their own personality, and I look forward to getting to know each of our girls on a deeper level. We have 15 layer hens, all Rhode Island Reds, which are supposed to be great dual-purpose birds (as in good, for laying and for meat) that are resilient free-range foragers. CZ Beekeeping at Gypsy Wagon Farm in Beach Lake, PA.
Today will be an exciting day, as Maureen and I will head over to a local farm to check out some old beehives. Our bee nucs will be arriving in about a month and we’ll see what we can reuse. 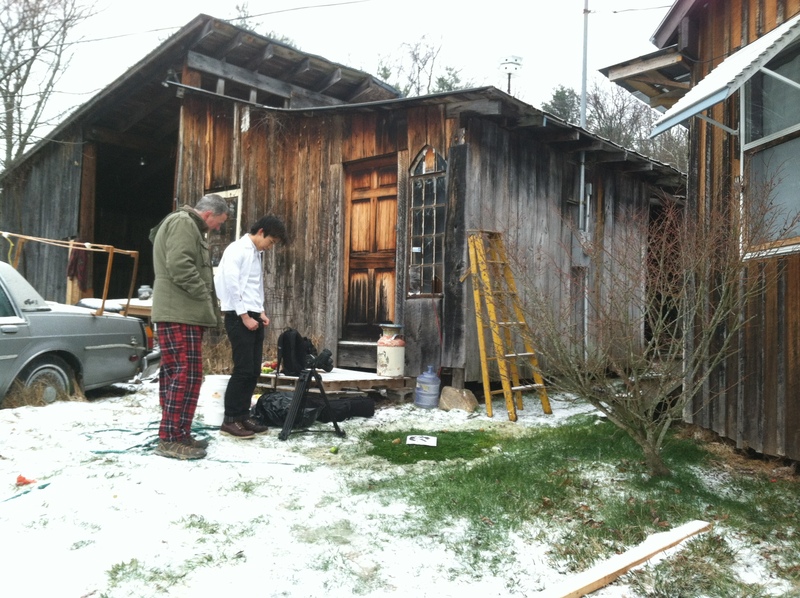 We’re also hoping that if there is still a live hive there we could transport it to Crow Forest Farm. Tom and Dennis film exploding fruit for the official Rock the Blocks Promo Video. Dennis Chang’s Amazing Promo Video for Rock The Blocks Music Festival! What a great addition to the farm, it’s really amazing what you can get from the mail these days.